Rudolf Steiner was a philosopher, social thinker, architect, and esotericist. His philosophical work, which he termed spiritual science, sought to provide a connection between the cognitive path of Western philosophy and the inner and spiritual needs of the human being. In The Way of Initiation, Steiner details the exercises and moral qualities to be cultivated on the path to a conscious experience of ‘supersensible’ realities. His short but powerful book is intended as a guide for achieving spiritual vision. Rudolf Joseph Lorenz Steiner (25/27 February 1861 - 30 March 1925) was an Austrian philosopher, social reformer, architect, and esotericist. Steiner gained initial recognition as a literary critic and cultural philosopher. At the beginning of the 20th century, he founded a spiritual movement, anthroposophy, as an esoteric philosophy growing out of idealist philosophy and with links to theosophy. Steiner led this movement through several phases. In the first, more philosophically oriented phase, Steiner attempted to find a synthesis between science and mysticism; his philosophical work of these years, which he termed spiritual science, sought to provide a connection between the cognitive path of Western philosophy and the inner and spiritual needs of the human being. In a second phase, beginning around 1907, he began working collaboratively in a variety of artistic media, including drama, the movement arts (developing a new artistic form, eurythmy) and architecture, culminating in the building of the Goetheanum, a cultural centre to house all the arts. In the third phase of his work, beginning after World War I, Steiner worked to establish various practical endeavors, including Waldorf education, biodynamic agriculture, and anthroposophical medicine. Steiner advocated a form of ethical individualism, to which he later brought a more explicitly spiritual component. He based his epistemology on Johann Wolfgang Goethe's world view, in which "Thinking ... is no more and no less an organ of perception than the eye or ear. Just as the eye perceives colours and the ear sounds, so thinking perceives ideas." A consistent thread that runs from his earliest philosophical phase through his later spiritual orientation is the goal of demonstrating that there are no essential limits to human knowledge. 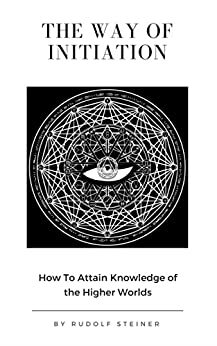 Review of: The Way of Initiation (or How to Attain Knowledge of the Higher Worlds) by Rudolf Steiner. 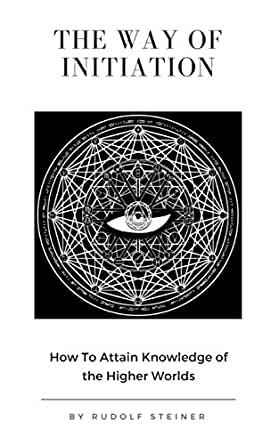 This is an important treatise addressing the latent faculties by which a person may acquire knowledge of the higher worlds where the mystic, master, theosophist, or gnostic realizes that the soul world and spirit-world, which are, for that person, just as real as the world seen with our eyes and touch with our hands. He who seeks for higher knowledge must create it within himself; he himself must instill it into his soul. This book ensures that it is so. It represents a guide and an affirmation. Well done. Five stars. This can help a person understand the role of initiation. Each part of any initiation serves a significant purpose in the growth and worthiness of the initiate. This book provided good insight. 5.0 out of 5 starsThe way of finding great books. Anyone familiar with H.P.B's works will have seen her refferances to this author. Yay for Amazon. This book is really for the Initiate of the Rose and Cross. The information is good but the writing is old fashioned and a bit tedious.